Certain types of tea have proven anti inflammatory properties that could be as effective as non-steroidal anti-inflammatory drugs (NSAIDs). These drugs have adverse effects especially gastric irritation leading to the formation of gastric ulcers. Black tea, white tea, and green tea can be used as natural pain killers and to fight inflammation. These teas are loaded with polyphenols, naturally occurring phytochemicals that can boost the immune system and protect against certain inflammation-causing diseases. Did you know that tea is the most consumed beverage in the world after water? Yet the huge variety of teas available at your local supermarket can be very confusing for the average person: black tea, green tea, oolong tea, rooibos tea, jasmine tea and much more. When you want to know what to buy, you first of all need to understand the main tea varieties, the differences between them, and their main health benefits. Tea plants (Camellia sinensis) are native to East and South Asia. Tea has been used for thousands of years in China for medicinal purposes, and later on people have started to use it as a beverage. Drinking tea arrived for Great Britain around 1660, but was not widely consumed there until the 18th century due to its expensive price. Tea became more widespread beverage among other parts of the British society by the late 19th century, but it was still mainly used for special occasions. During the 19 century tea was first introduced into India by the British, who wanted to break the Chinese monopoly on tea. The British started to develop tea industry in India, resulting in export to Europe in large amounts which brought the tea price down. This article will explain the differences between the main tea types black, oolong, green and white tea. These 4 types of tea all come from the Camellia sinensis plant. The difference between them comes from the difference in the way they have been processed. Black tea is the most processed tea. When the tea leaves are picked, they are left in the sun to slightly wilt. Then the leaves are rolled to break their tissue. Then starts the process of fermentation where the leaves darken from green to red and finely become black. In the fermentation process the leaf cells are exposed to oxygen, and a chemical reaction (oxidation) takes place that causes the leaf to darken. Health benefits – according to a medical study, black tea may protect lungs from oxidative damage and inflammation caused by exposure to cigarette smoke. According to one study black tea has anti-inflammatory properties. Black tea may also reduce the risk of stroke. This tea has also been linked to lower levels of cholesterol in people with mildly high levels. Other attributions include helping lower blood pressure, regulating blood sugar, and stimulating the circulatory system. Oolong tea goes through the wilting process like black tea, but this stage is shorter, so the color of the leaves is dark green or red to almost black. The longer the fermentation is, the closer to black tea it will become. One scientific study found the oolong tea contains nutrients that can fight inflammation. Health benefits – In my article about the amazing benefits of oolong tea & how to use it you can find more information and research about its antioxidative properties and how it can help you in losing weight, controlling blood sugar levels, reducing the risk of developing certain cancers, reducing the risk of plaque buildup in the arteries and more. Whereas black tea goes through full fermentation, and oolong tea is partly fermented, green tea doesn’t go through fermentation process. Instead, after the leaves are picked, they are steamed or pan fired. Then the leaves are dried and packaged. As a result of the different processing, green tea has less caffeine than black tea, and it also has HGCG which is a powerful antioxidant that can be only found in green tea. Another type of green tea is Matcha tea which is believed to be the highest quality powdered green tea on Earth. You can read more about the health benefits of this tea in my previous article 9 Amazing Health Benefits of Matcha Tea. According to a medical study, green tea can help fight chronic inflammatory diseases. Another study found that green tea can be better in reducing inflammation than black tea. Health benefits – Medical studies have found that green tea’s antioxidants may interfere with the growth of various types of cancer. It also helps prevent clogging of the arteries, boosts metabolism, regulates blood sugar levels, reduces the risk of cardiovascular disease, reduce risk of neurological disorders like Alzheimer’s and Parkinson’s diseases, reduce risk of stroke, and improve cholesterol levels. White tea is also not fermented and is the least processed tea, and therefore contains the most antioxidants. The tea leaves are picked from newer buds, early in the year. Only the top leaf and bud are picked. Then they are dried in the sun (or mechanically baked) and are not steamed or pan fired like green tea. The result is a very pale yellow tea with slightly sweet taste. This tea has a very low level of caffeine. A medical study found that white tea has antioxidant and anti-inflammatory activity. Health benefits – one study showed that white tea has the most potent anticancer properties compared to more processed teas. Other health benefits include lowering blood pressure and cholesterol, reducing blood sugar levels, reducing the risks for heart diseases and strengthening the immune system due to its anti bacterial and anti viral properties. These are created when one of the four major types of tea (black, oolong, green or white tea) is the base, and added to it are other herbs. For example: a blend of black tea and bergamot is called Earl Gray, and black tea blended with a mixture of aromatic Indian spices and herbs is called masala chai. Herbal teas are not “true” teas, as they come from different plant sources and not from the tea plant Camellia sinensis. They are made from herbs, fruits, flowers, seeds or roots steeped in hot water. Varieties include rooibos, peppermint, chamomile, echinacea, jasmine, ginger, mint and many more. Rooibos for example, sometimes called red tea, is made from another plant entirely, Aspalathus linearis, and is a traditional South African infusion. 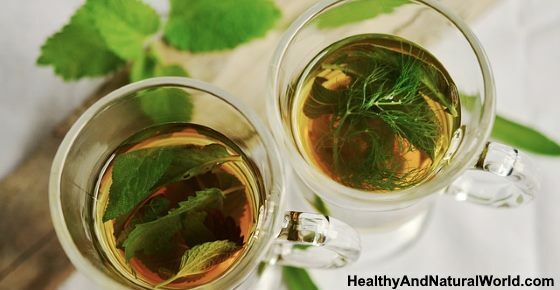 Health benefits – Limited research has been done on the health benefits of herbal teas in comparison to the traditional teas. Some findings include a small scientific study published in the Journal of Nutrition that found that drinking three cups of hibiscus tea daily could help lower blood pressure in people with modestly elevated levels. Turmeric Ginger Tea can fight pain and inflammation. Chamomile Tea. Medical studies have shown that chamomile is a natural medicine for the treatment of inflammation-related disorders. Echinacea Tea can help with inflammation. Although a lot of questions remain as for how long a certain tea needs to be steeped for the most benefits, and how much you need to drink of it, nutritionists agree that drinking tea is good for you. So if you want to incorporate healthy beverages in your diet on a more regular basis to benefit from these health-promoting properties, it’s not just about which foods to eat. It’s also about what you drink that can contribute to your health. Chai tea is a combination of tea, spices and milk. When prepared in the right way, this Indian drink can be a real health booster. Chai tea comes from the Ayurvedic medical tradition and is particularly good for immunity and digestion support. If you decide to prepare it at home, many different recipes are available. Chai teas served in restaurants and bars often contain large amounts of sugar and cow’s milk, which reduces their medicinal value. If you prepare your chai at home, you can tailor it to your own needs and desires and make it a truly healthy beverage. Each of these botanical components is known for its own health benefits, and when used together, the benefits get increased. Cinnamon aids digestion, balances blood sugar, acts in an anti-inflammatory way and is a powerful antioxidant. Cinnamon can also be used as a natural remedy for weight loss and as a natural medicine for numerous ailments. For best medicinal effect, use the Ceylon cinnamon. Cardamom is an important ingredient in many Tibetan medicinal formulas. It helps with digestion, improves circulation, boosts immunity and has a detoxifying effect on the body. Ginger is an old favorite, used for digestion problems and colds, and helps to reduce inflammation (especially when used with turmeric). Ginger is also one of the medicinal plants mentioned in my e-book the Herbal Remedies Guide which will teach you how to treat common ailments using herbs. Clove has great digestion properties, relieves pain from stomach ulcers and is also one of my natural remedies for treating gum infections naturally. Fennel is rich in antioxidants, vitamin C, potassium and fiber. It has been suggested that it protects the body from cancer. Black pepper has a positive effect on metabolism, aids digestion and has anti-bacterial and antioxidant properties. Most commonly, the tea used for chai is some variety of black tea, but green or oolong tea can be used as well. Some people like to prepare the infusion using spices only and omit the tea all together (for example, if trying to avoid the caffeine effect). The spices themselves are so potent that the beverage is going to provide you with a real immunity kick no matter how you choose to prepare it. If you opt for a more traditional version, black tea is a powerful antioxidant. Antioxidants obtained from black tea are different from those in fruit and vegetables. They block DNA damage associated with tobacco or other toxic chemicals. Black tea does contain some caffeine, but much less compared to coffee and can replace the need for stronger caffeinated drinks. De-caffeinated tea is available as well. Milk is used for taste and richness and doesn’t add any medicinal value to chai tea. You can avoid using cow’s milk and replace it with coconut milk, rice milk or you can use my healthy home-made milk substitutes. Due to its soothing effect on digestion, chai tea is best consumed after a meal. Simply, simmer the spices and tea for 10 minutes, add your choice of milk, sweeten with raw honey (which has amazing health benefits) and strain before serving. You can be sure that your cup of chai tea is filled with powerful antioxidants and your immune system will rejoice while you enjoy the delicious beverage. Rooibos is the best tea you can get. In South Africa you get the Annique Rooibos tea with diferent herbs and it helps for different health conditions there is even a green rooibos tea available. Rooibos tea is indeed great! What type is called white tea? Can you share brand of white available in supermarket? All the big brands have white tea, such as Twinings and Lipton. It is says on the package “white tea”. I appreciate all your posts. Very informative. And this one i love so much. I just want to ask, where does Ginseng belong? Herbal? Thanks so much. Yes, ginseng is an herbal tea. Thanks for posting this. i drink alot of tea. and i make sweet tea. (With less sugar than normal) i have actually stopped drinking coffee, as it was bothering my stomach. Herbal Infusion’s Are Called Tisane’s And Have Nothing To Do With Tea Beside’s The Fact That They Are Made Like Tea And That Is All. Is decaffeinated green tea as benificial as regular caffein green tea? According to this article, white tea seems the best for your health, so why is green tea always the one talked about for health benefits?